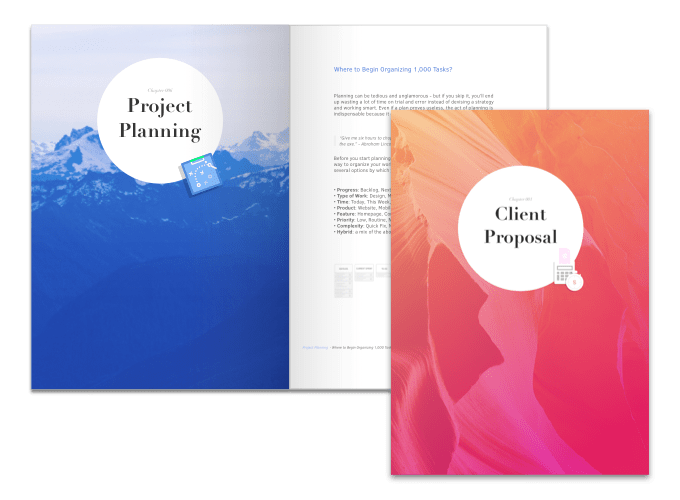 Everything you need to know to successfully manage digital projects, get paid, and make your clients happy. How to manage proposals and project requirements so clients get what they need. How to plan projects and monitor progress using agile techniques. How to collaborate, track time, and get paid for your work. Digital projects are different than traditional. Most techniques and frameworks taught at universities and business schools are to complex for teams working on digital projects (like building a website, making an app, or running a marketing campaign). Digital products are malleable by their nature: they’re easily changed, adjusted, and improved. That's why agile project management principles are best for digital project management. 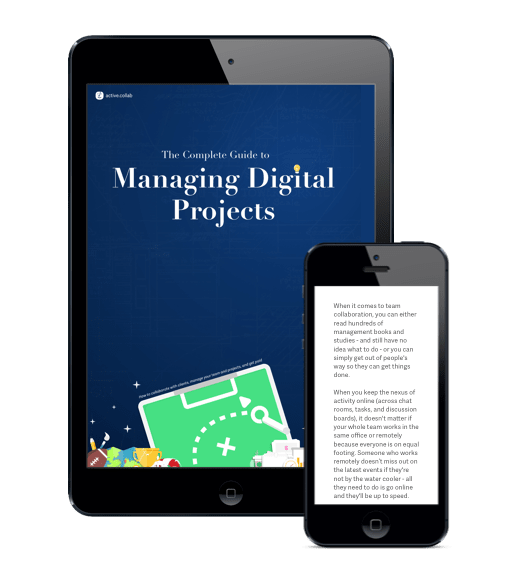 This guide lays out how to manage digital projects from start to finish. It covers the complete process from the moment a client asks you for project estimate to finishing it and getting paid. The first part deals with client communication and how to kick off projects. It covers client screening, giving estimates, kickoff meetings, defining project scope, and signing a contract. The second part is about project management and how you can become very good at it as long as you know the basics. It covers principles of agile project management, project manager role, project planning, dealing with bottlenecks, and monitoring progress. The third part delves into collaboration and getting things done. It covers how to collaborate with clients and your team, what makes good a team, how to track time and issue invoices, and control the budget. The final chapter goes beyond projects and answers the question: why organizations fail to grow and what you should be doing now in order to be successful in 10 years. How to give a project estimate? What you must cover in the first client meeting? Why most agencies fail to grow? Why classical project management fails when it comes to digital projects? What's a project manager's real job? How to deal with bottlenecks? What are the 3 most important things you always need to know? How to keep everyone in your team on the same page? What separates a great team from an average one? What are the most common collaboration myths? Why people cheat on their timesheets? Negotiating with potential clients eats into your billable time - the time you could spend working on projects and earning money. But saying yes to the wrong client will cost you a lot more. That’s why you need to screen clients, set the right budget expectations, and only take the projects that are right for you. After you give your client a rough proposal (and they say yes), you’ll be tempted to start working right away - but that’s not such a good idea. First, you need to flesh out the project scope, agree on how you'll be working together, work out a payment schedule, and sign a contract - and then start getting actual work done. It's important to set up ground rules from the start if you don’t want to spend the rest of the project extinguishing fires. Once you’ve covered the project scope and collaboration process during the project kickoff meeting, it's time to talk about money. You have to protect yourself from undercharging your work. Never start working on a project before you make sure who pays what, why, and when - and have a backup plan if the project fails. Processes are tedious as hell, but if you don’t set them up, you'll waste time, miss deadlines, go over budget, infuriate your clients, and never work again. Thankfully, most digital projects don't require elaborate processes. Simply breaking down work and tracking progress is all you need to pull off a successful project. Project management is easier than ever before being a project manager somehow became tougher. Why is that? Software automated a lot of the work, but the way project managers use that time and a concrete value they provide is often questioned. It's exciting to start working on a new project. The team is tempted to just dive in and start coding, designing, and creating. But as a project manager, it's your solemn duty to make a game plan first. Industry stats say that less than 1/3 of all projects are completed on time and budget. It doesn't have to be this way. To prevent a project from spiraling out of control, a project manager has to constantly monitor progress, watch out for potential problems, and take corrective measures. When it comes to team collaboration, you can either read hundreds of management books and studies - and still have no idea what to do - or you can simply get out of people's way so they can get things done. No collaboration workflow is complete without the client. They should be the biggest collaborator on your team but many agencies make a mistake by building a wall around what they're doing. When you charge by the hour, time tracking is a must. After all, you can only charge a client if you can show them the timesheet. But even if you charge a flat fee, it's a good idea to track time so you can gauge how productive you are. Billing is too important to leave it to your accountant. You need to bill quickly and bill often to keep money coming in at all times - the last thing you want is to miss payroll and lose employees. But to bill often, the process has to be really quick and simple. Otherwise, you'll put off of creating invoices, uninvoiced work will pile up, and when you finally do send an invoice, you'll have to wait for the client to pay it - which leads to serious cashflow problems. * If you're our subscriber but you don't see the download button, please enter your email again. You won't be receiving a double newsletter, we just need to check your address. You now have access to all our project management guides.